Oil Sheen visible after an oil spill with the Alyeska Pipeline Service Company in Valdez, Alaska. There was a problem executing a test which may have led to an oil spill Thursday in Valdez, Alaska, officials said. Alyeska Pipeline Service Company believes a failure in firewater systems may have caused the spill. 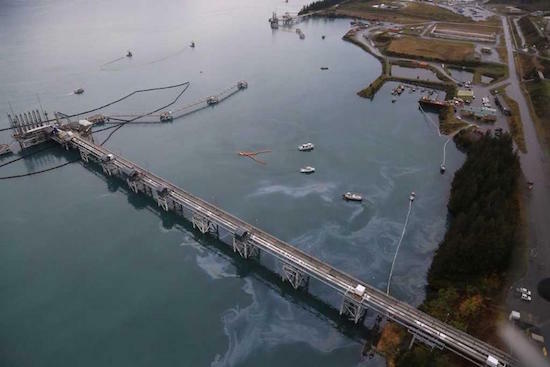 “The spill was caused by a preventative maintenance task that we were doing last week in order to test the integrity of our loading arms,” said Alyeska public information officer Kate Dugan. The initial pressure test involved draining oil to a tanker then filling them with salt water, Dugan said. It was during this process the mixture flowed back out of an auxiliary piping which, combined with ocean recovery, made crude oil spill estimates difficult. “It was already a mixture, and when you are picking up water it was mixed again. So, we won’t know the exact number for a while,” said Dugan. The majority of the spill has been recovered, she said. They are focusing on decontaminating vessels and cleaning up berths. The Alaska Department of Environmental Conservation said they are continuing to monitor the situation and will work with the company as they continue their cleanup process. About 400 gallons of an oily water mix have been recovered by field crews. Approximately 185 people have been involved in the response and there are more than 120 responders in the field. Clean-up efforts focused on protecting sensitive areas around Port Valdez that include the Solomon Gulch Hatchery and Valdez Duck Flats – both areas were boomed overnight.